This is similar to creating and saving an Eclipse chart. If more than one Ingress date and time are listed tap an Ingress record to select – a tick will appear. Tap Chart/Done and then Save – the Ingress chart is displayed. The chart name is automatically inserted. It can be edited before saving. The Chart Category is automatically inserted. This shouldn’t be changed. 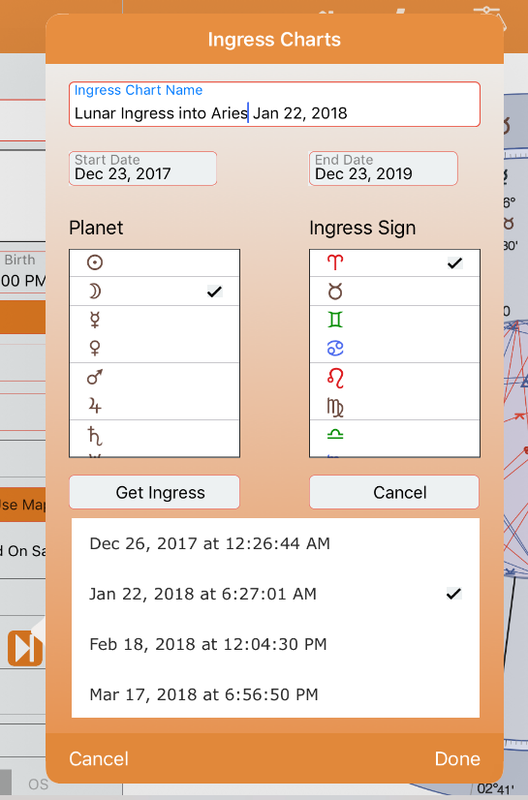 Ingress charts are classed as Natal/Radix charts by AC for the purposes of filtering and display, although their Chart Type is “Ingress”. Elastos – should I have expected something! Are major inflexions in Bitcoin’s price signified by Saturn’s ingress into different signs? Bitcoin: Transiting Neptune’s aspect to radical Venus. Sept 1st 2018. Elizabet on How accurate is AstroConnexions?